Fairlands Valley Spartans will have to work hard in Thursday evening’s fourth and last counting event in the Mid Week Road Race League after a mishap in the Harlow race on Wednesday. In order to avoid relegation the club is calling on all who can to run the seven mile event in St. Albans on the 28th. A slightly reduced but still impressive contingent of sixty two Spartans lined up for Wednesday’s Mid Week League race which was on a largely cross country 10K course in Harlow. The running surface and undulating terrain did not seem to worry some as their were several personal best times. ROB WILLIS (35th) ran his first 10K for the club in 38 minutes 14 seconds; DARREN WILBY (135th) improved to 45:09; JON SYPULA (152nd) to 45:54; JULIE SIMMONS (175th) to 47:21; RHIANNON GRIFFIN (180th) to 47:38; JENNIFER ROBERTSON (195th) to 48:44; VISHAL SHAH (201st) to 49:05; TONY VICKERS (204th) to 49:14; TRACY BULLOT (226th) to 51:19; and SARAH SAPSTEAD (312th) to 1:04:46. Many improved on their times on the faster Welwyn Garden City course! TRUDIE MOLLOY and SIMON STEWART ran their first 10Ks in 52:19 and 52:49 respectively. SIMON JACKSON (11th in 35:56); SHAW PYE (16th in 36:20); ANDY NEATHAM (17th and fourth “vet” in 36:22); GRANT RAMSAY (30th in 37:42) and ANDREW PATTERSON (31st in 37:53) were the fastest men for the club. TRACY PEZ (150th in 45:51); Julie Simmons (above); Rhiannon Griffin (above); Jennifer Robertson (above) and DAWN EASBY (198th in a season’s best 48:48) were the quickest Spartan women. IRIS HORNSEY was the first woman vet (65 plus) in a season’s best 59:35; BEV HARLOW was second woman vet (55 plus) in 52:22: and BARRY OSBORNE was third vet man (60 plus) in 43:42. A club casualty on a bridleway just over 5K stopped or delayed several Spartans who were in the top half of the field. This inevitably had an effect on the team result. The Spartan men came fourth out of the six teams but unfortunately their women, more dramatically affected by the incident and missing some of their faster runners, came last. This meant the club were fifth on the night and in the same position in the league. They must improve to at least fourth to survive in division one. The results for all sixty Spartan finishers will be found at the very end of this release. This weekend Spartans TRICIA HOPPER and KAREN LIDDLE took part in the Hadrians Wall ultra 69 mile race over 2 days, finishing in a total 16 hours and 57 minutes. They both feel tired but fab and even had a little left to break into a sort of sprint over the Millenium bridge. 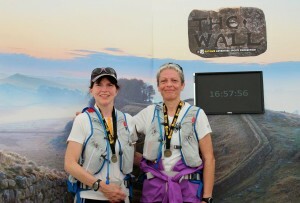 Tricia and Karen quite rightly really chuffed at their achievement. ROGER BIGGS took part in possibly the hardest road marathon in the UK on Sunday — the Lancaster Castle Marathon. There was a long climb out Lancaster into the surrounding countryside, then several stiff climbs before a monster hill at 18 miles. Despite this, Roger ran the whole 26.2 miles in good conditions. Roger’s time was good enough over a tough course to place as the first vet 60, winning £50 for his troubles, with a time of 4 hours 8 minutes 10 seconds. Fairlands Valley Spartans got in the Olympic mood with their own torch procession and games at Ridlins Track on Sunday afternoon. There were 320 finishers. 203 men and 117 women.